“Spring is in the Air,” literally and figuratively, for the final concerts, Program IV, April 2 – 5. The joy of Copland’s “Appalachian Spring Suite” is countered by the dark, harmonious melodies of the Brahms Symphony No. 4 in E minor. The South Florida Symphony performs its programs in Key West, Fort Lauderdale and Boca Raton. 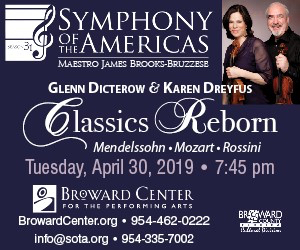 For show times and tickets, go to SouthFloridaSymphony.org.